This week’s Change It Up Challenge begins with a confession–I am a selfish movie watcher. While Matt is benevolent and broad-minded in his movie-watching tolerance (as evidenced by the fact that he watched the 4-hour version of Jane Eyre with me this weekend without complaint), I am downright stubborn in the types of movies that I will watch with a pleasant attitude. Among other types of films, I currently refuse to watch any war movie, most horror movies, and Planet Earth documentaries. I know, I’m highly uncultured. Matt has always loved Westerns and has been trying to convince me to watch them for many a moon…one time he even succeeded by bribing me into watching Silverado with my sister Sarah and her husband Jared (which inevitably involved lots of ice cream and a free dinner to boot, so how could I say no?). I somehow got horribly lost within about the first ten minutes and spent half the movie trying to figure out what was going on. The second attempt was only a couple months ago, when he put in My Name is Trinity after lobbying for it in my family’s annual Christmas white elephant gift exchange. I was dead asleep about twenty minutes in. But, as it so often does, my guilt for my behavior started to catch up to me…Matt has watched almost nothing but chick flicks with me for about the last six months, so I figured it was time to give him a break. 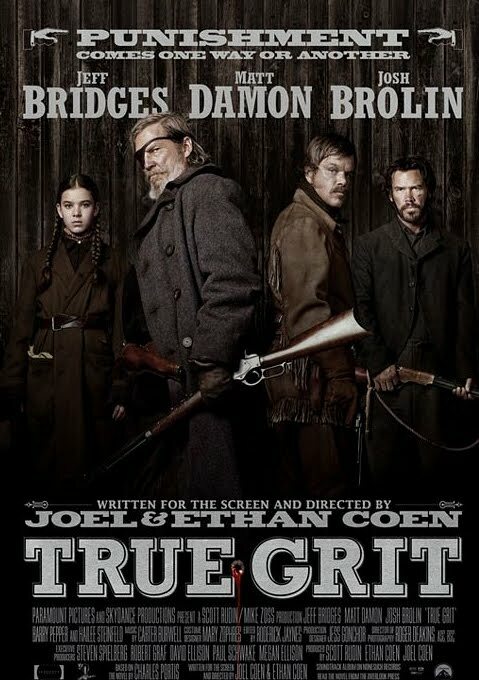 I saw that True Grit had finally made it into the discount theater here (which Matt has wanted to see since it was released), and I decided to be self-sacrificial and suggest that we make a date of it. So hand in hand we went on Friday night, ready to be wowed by wild outlaws and beautiful belles. What we ended up with was a mostly-entertaining flick with a strong female lead (always a plus), an appropriate mix of suspense and comic relief, and a story line that even I could follow. What we also ended up with was both of us closing our eyes during some overly-graphic violent scenes, when a man’s fingers get cut off and his partner gets a shot in the face at close range. I’ve also always hated the way American Indians are portrayed in such films, and this one was no exception. But, for a Western, I had to say it’s the best I’ve seen. Out of all two and a fifth that I’ve actually viewed, that is.